Bank of America is the second-largest bank in the nation, after JPMorgan Chase. The bank has a presence in all 50 states and maintains around 67 million consumer and small-business relationships. Bank of America offers more than 20 credit cards to its customers, each with different benefits and drawbacks. Keep reading for a review of one of its featured cards, the Bank of America Premium Rewards credit card. 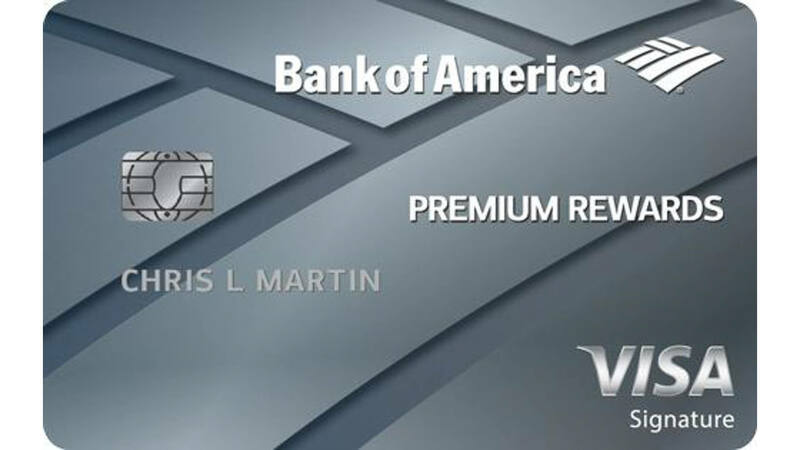 The Bank of America Premium Rewards card takes advantage of a rewards program where cardholders earn points based on purchase amount. The points can then be redeemed for gift cards, travel purchases for airfare, rental cars and hotel reservations via the Bank of America Travel Center, or customers can keep things simple with cash back. Keep in mind you need 2,500 points or more to begin redeeming. The Premium Rewards credit card lets customers capitalize on this through opportunities to earn bonus points. Customers can earn 50,000 bonus points — which comes out to $500 worth of rewards — by using the card to make $3,000 worth of purchases within 90 days of opening the account. This only applies to new accounts and will not cover converting existing accounts to nab points. Once the qualifying purchase amount has been met, expect to see the points credited to your account in two to three months. Beyond the bonus point benefit, the Premium Rewards card also accrues points through your everyday shopping. You earn two points for dining and traveling purchases and 1 1/2 points for all other purchases. This is a higher valuation than most credit cards with similar points systems, which usually use a one point to $1 ratio. There are no limits to the number of points you can earn, and the points do not expire. However, closure of an account, for any reason, with points attached to it might result in points forfeiture. This Bank of America rewards card saves you money by earning you credits depending on the purchase. You can receive a credit for $100 from qualifying purchases including seat upgrades and in-flight services. Plus, when you use the card to cover the fees for a TSA pre-check or a Global Entry application, you can also earn a $100 credit. There is no foreign transaction fee with this card, either. The card lets customers take advantage of travel insurance protection to cover luggage and flight cancellations, among other unforeseeable circumstances. The card comes with a variable APR of 18.24% to 25.24% depending on your creditworthiness. There is also a penalty APR of up to 29.99%. If you do not pay off your entire statement each billing cycle, there is also a minimum interest charge of $1.50. The Bank of America card requires an annual maintenance fee of $95. Balance transfers carry a fee of either $10 or 3% of each transaction, whichever is greater. Expect a $10 minimum charge on cash advances, too. Late payments will cost you up to $39 and returned payments cost up to $28. Not every credit card is right for each consumer, so you want to weigh the features of each card to see if it fits your needs. The Premium Rewards card is best suited for travelers and consistent spenders. Most of the perks only work in relation to traveling, although the bonus point feature can be used toward anything. On the other hand, even homebodies should note that every $1 spent earns you 1 1/2 points and that earning two points per $1 also applies to dining out. Variable APR also lets those who might not have the most glowing credit score to partake in the benefits. The fees will add up if you are not careful with your spending habits, which will affect your Bank of America credit card payments. Click through to learn about the 15 best credit union credit cards. This content is not provided by the companies mentioned. Any opinions, analyses, reviews or recommendations expressed in this article are those of the author alone and have not been reviewed, approved, or otherwise endorsed by Bank of America.